Master Wang Li Ping, 18th generational transmitter of Dragon Gate Daoism will teach a 10 day retreat intensive in San Francisco CA, USA December 20 – December 29 2018. This is a unique opportunity to study with the greatest living Master of Daoist Internal Alchemy. This year Richard Liao’s annual Winter Solstice retreat will be hosted conveniently for North and South American students at the Bayshore Weston in San Francisco, California. I encourage you to read Opening The Dragon Gate to experience the simply incredible (yet true) story of Master Wang’s upbringing and training with three aging Daoist Masters before and during the Cultural Revolution in China (and since). For yet further insight into his teaching read Ling Bao Tong Zhi Neng Nei Gong Shu or (roughly translated) Spirtual Jewel Arts for the Inner Development of Mental Capacities. This edition includes a rare translation of Master Min’s ‘Secret of the Golden Flower‘ with special emphasis on practical application and ChongYang’s ‘Five Ling Articles‘, the inner alchemy transmission from Master Wang to Cui Chi Qi, the founder of Dragon Gate Daoism, and Master Wang Li Ping’s ultimate grandmaster. As a 40 year student of Daoism and a 12 year student of Wang Li Ping I can tell you honestly there is no comparable teaching available, anywhere. As a huge bonus this year, Master Mantak Chia is going. 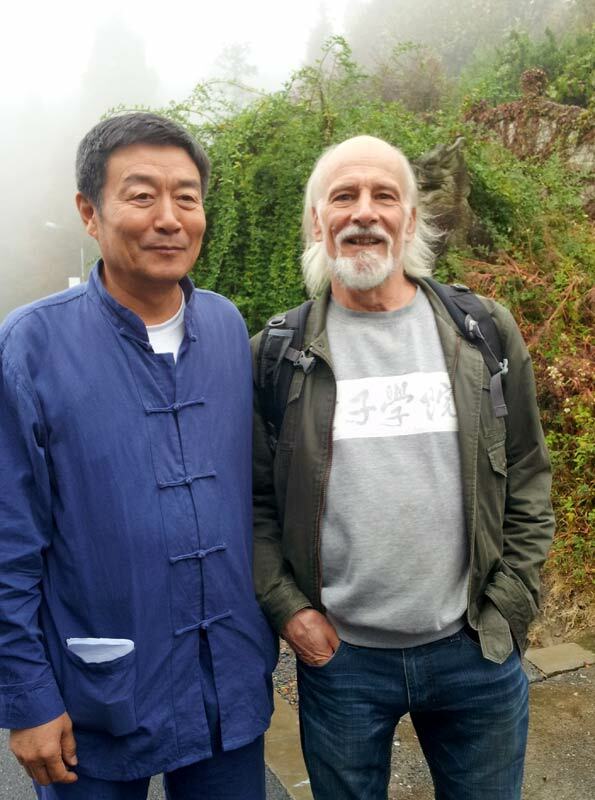 Join in a unique opportunity to study alongside Master Chia with the modern Taoist wizard, Wang Li Ping. Master Wang Li Ping’s International Winter Solstice retreat, hosted by his translator Richard Liao was held in Dalian China in 2017. The venue that year was the old Hot Spring Hotel in Anbo Town, 2 hours north-east of Dalian in the arid frozen countryside. They try to ski on the barren hills, snow-making guns going non-stop for the ‘holiday’ season. The retreat is over Christmas, Dec 20 – 29, but you do not see much Christmas in China, a few Santa Claus in very Chinese red suits. Panda like. It sort of works. The retreat was held in a carefully blacked-out room. It’s Winter Solstice. It’s cold. There is (luke warm) hot water for about 2 hours in the morning. Morning walking practice starts in the dark. It’s minus 20 or so most mornings. So in that deep yin, the yang should stand out. It is a hot spring area. The hotel is occassionally a destination for a busload of visitors on the weekend. The yang is really there, piped in from underground. I had not seen Master Wang since 2012. 5 years and two months since the Jin Hua Retreat. Events that transpired from that retreat had in those five years, transformed my life and my sense of who I was (am). I met Randi, many thanks to the lineage. A process was initiated that culminated for me in December 2016. That year, Richard’s retreat was held in Hilo, Hawaii. That meant the evening Shui Gong (sleeping practice) sessions, that normally start at 10:00 pm started conveniently at 3:00 pm in the afternoon in Thailand where I spend my winters. I find that it’s often possible to join the Master for shui gong from anywhere. Several evening during the 10 days I had profound experiences, that linked together many experiences I had been having in the previous months/years, and culminated with a singular ‘Joining of Sun and Moon’. I have been a student of Taoist Scripture (in translation) for as long as I have been Taoist (50 years). One passage among many stood out “Ingest one drop if this and you know your destiny does not depend on heaven”.If you know where to look, it is all written down, so talking about it reveals nothing new. In the weeks following the I talked to Richard about having the next retreat at Tao Garden where I live in the winter. The plans actually got quite advanced (and expensive), and it was eventually decided to hold the event in Dalian in 2017. I also committed to going to that retreat. I realized I had arrived at the point where I felt I had a grasp of the practice that previously escaped me. I felt ready. I let Richard know I would ask Master Wang for permission to teach. The retreat started and ended up as somewhat of a trial. A few days before, I contacted an eye infection I failed to treat before leaving. The entire ten days it got worse and worse until my left eye was red, weeping and horribly itchy. Richard got some ointment once we were back in Dalian. Even that was not much help. Only antibiotic drops cured it back in Thailand. Master Wang kept putting off any meeting. The 15 Chinese students definitely kept him busy. Richard kept trying, almost despairing at one point. Only on the second last evening did I get to meet the Master. With Chinese students running in and out, Richard and I carried out this (to me) delicate task. I wanted to talk about my experiences with Randi and the roots of dual cultivation in the Northern Branch. With Master Wang I simply assume he knows everything so you can just get right to the point. I asked if our having received the practice meant it was something for us share, to teach? He looked at me ‘sort of strangely’. “It’s only for between a male and a female. A man cannot teach a man etc. So how would we teach? He clearly did not think it appropriate for me to teach a woman. How much can you even share. I described how we had experimented with many “arrangements”, facing one another, side by side, etc, many (most) not actual, or barely touching. He had a few pointers! Obviously he was familiar with the experiences I was describing that are not in any written form except by very abstract allusion. Hint, the image on the back of Ling Bao Tong Zhi Neng Nei Gong Shu is describing it. This image is of Ancestor Lu. He learned the dual cultivation practice in Sichan from a female master according to some legends. 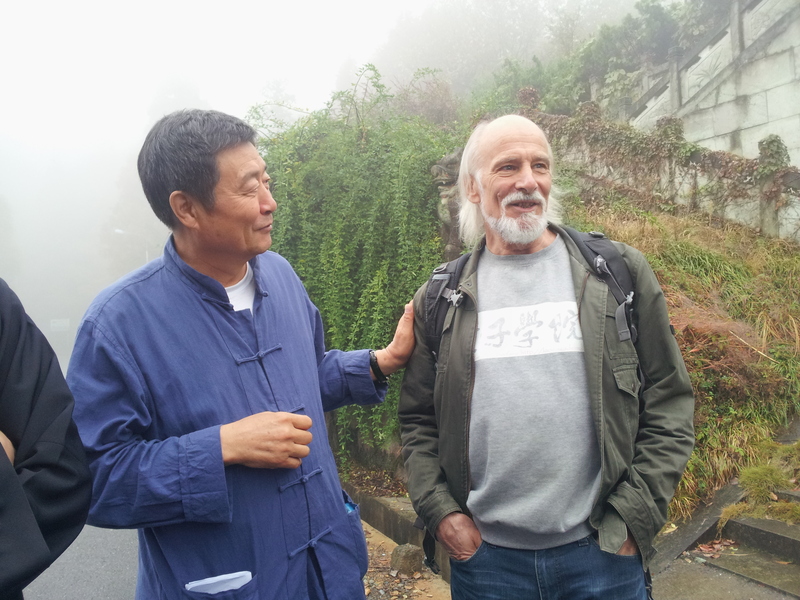 Richard firmly brought the conversation back to permission to teach Master Wang’s system as described in the Ling Bao Tong Zhi Neng Nei Gong Shu. Richard’s words came out. At least I assume he knew exactly what to say. Master Wang smiled smiled. “Yes, certainly, and you must charge money”. That was it. On the way out Richard said, “You do not have to charge money”. I could only say “If the Master says charge money. I think I have to charge money”. How prescient he was. I’ve been re-reading “The Teachings and Practices of the Early Quanzhen Taoist Masters” by Steven Eskildsen, available from Google Books as an ebook. I’ve been pleasantly surprised at how many useful and inspiring quotes from Wang Zhe and his students. If you are not familiar with the Quanzhen (Complete Reality) school and the immense influence it has and continues to have on the development of Daoism in China sine 1100 AD this book will be an excellent introduction. It’s not well understood that almost all of the Daoism accessible in the west descends from this school and from this one master. “Ask not about the dragon and the tiger. The single point in your mind is your enlightened master. The mind rectified in diligence and sincerity produces a warm glow. To constantly serve all sentient beings equally is the Great Tao. If [your mind is kept] pure and clear without relent, you will gain true compassion. “If you know the good visage, do not hold on to externals. Your mind-spirit is your true teacher. But your own school of thinking must be spread about. More and more you show forth your compassion of old. “Resolutely yearn for the Tao and have nothing [else] that binds and enwraps you. Isolate your body and sleep in solitude. When stillness arises within the stillness, you will attain the wonders. When calmness arrives within the calmness, you shall definitely unite with the mysterious. Now you can act with free abandon, and know what it is to be relaxed and content. Passing the days in refreshing coolness is the inborn saint. Quit wishing for divine immortality, quit speaking of it! These men led lives of extreme asceticism. Wang Zhe dug a deep hole and lived in it for three years (a symbolic grave). He then filled the hole and built a hut (Complete Realization Hut) over the whole from which his entire lineage took it’s name (QuanZhen). One day he burned the hut in a fit of apparent madness, cutting of yet a further ‘attachment’. There were no limits to his realization of freedom. I’ll post further snippets as I come across them and the spirit moves me. To the great good fortune of practicing Daoists everywhere, new translations of both available texts and previously un-translated ones are becoming available. Most importantly Fabrizio Pregadio has added his translations of The Canton Qi, Awakening to Reality, Wang Mu’s Foundations of Internal Alchemy and Lui Yiming’s Cultivating the Tao. Foundations of Internal Alchemy is well know in China, as is Wang Mu, the author. His clear commentary on the alchemic process from the late 1800’s may hold surprises for many practitioners, but likely not as many as Cultivating the Tao. The common theme they address at length is the difference and relationship between the pre-celestial and post-celestial. Anyone looking for success in their nei gong practice should study these texts. Then there is the Richard Liao’ s translation of Wang Li Ping’s Ling Bao Tong Zhi Neng Nei Gong Shu. This collection contains a new translation of a seldom translated ( Min ) version of The Secret of the Golden Flower as well as the 5 Ling Articles. This last chapter of Richard’s translation is a gem. Here, Richard’s imaginative phrasing in translating ‘impossible’ Daoist language really works. This work is the nei gong transmission Qiu Chuji, the founder of the Longmen Pai received from his master Wang Chongyang. Not something that can be approached with the mind intellectually (at all!). The author describes a process beyond purpose. With repeated reading, the aspirant may hope to find descriptions matching their own experiences in practice. This is both extraordinary affirmation and an unmatched guidepost to progress. As far as I know this is the only English translation of this extremely useful text. On the third morning of the retreat I had a ‘vision’. This would be similar to what is referred to in the west as a vivid dreaming state. You are in a dream-like state but you are awake. You are aware that what you are experiencing is an extraordinary state. While lying on my bed, after walking practice a light red cylindrical ‘cloud’ appeared far overhead, seeming initially to really to be as ‘far away as heaven’. Shortly a thread started to descend from the near end of this ‘cloudlike celestial object’, which I noticed was already much closer. The thread dropped lower and lower, and came over very close. Closer and closer, very quickly, and it brushed against my bare arm. Once I touched it, In a flash the cloud and thread were gone, replaced by a Chinese immortal, complete with topknot and long beard, steering a boat around in the space immediately in front of me. He quickly passed very close a few times, looking at me carefully, his dog beside him, in the stern of the boat right where I would sit (if say, I just happened to be in a boat with an immortal, just say…, myself being a Dog in Chinese astrology and all that). The dog stared right at me the entire time. Even as the Immortal Helsman made quick turns as he guided the craft around at eye level, the dog never lost sight of me. The boat was not big, just a dingy really. He steered deftly, obviously no amateur in a boat ( I really hate that, being literally raised in a boat and extremely handy on the tiller. Many can attest to this I assure you). When I awoke, I immediately knew this was not an ordinary dream. The sense of the cloud and it’s thread were still with me. I could easily bring the vivifyingness of the chi of the thread right into my practice, and blend it with the qi I was working with, the jing chi in particular but also the chi of pore breathing, bone chi, the chi of nostril breathing and the qi that manifests as the ‘Brightness in the Empty Room’. To accomplish this it is only necessary to activate ‘the part of the shen that was awake in the dream’ and the chi from the thread activates in the practice. This aspect of the experience Master Wang later described as ‘special tricks learned in sitting practice’. I was encouraged by this as I was far from certain interacting with this chi was be considered favorible practice. ‘Do not let the thread break’ was his strongest piece of advice. I have been working with this since the experience. I got to the dining hall and sat with Ian Johnson, fellow Canadian and Bejing resident. Ian was in a rush to get to the Chongyang ceremony at the Immortal Wang temple. He explained it was the Double Nine day, The 9th day of the 9th Chinese lunar month is the day of maximum yang, 9 being the numeric of maximum yang in the I Ching. It’s the optimium day to ascend (if you happen to already be a realized practitioner that has satisfied all the prerequisites !). On Ian’s advice quickly I gathered my things and headed to the temple with my friends. The door was already closed when we arrived, but a few words from Kathy and we were let in. Right inside the door was Master Wang. He quickly grabbed me under one arm (Kathy stood there grinning silently) and guided me right into the middle of the ceremonial space and deposited me in from of a large sloping cushion (like I knew what I was supposed to do!). For reasons only Master Wang knows, he had me standing in his place. (what did I know). “Just do whatever the guy in the fancy robe does” Kathy whispered in my ear. Up and down, bowing to “Immortal Wang”, kneeling on that hard cushion, cymbals clashing, bells ringing, drums, the organ, an and on for 1 hour and 40 minutes, ending spectacularily as I held a burning yellow paper box like it was some scared object. The priestess made sure it did not topple (my hands were shaking a bit after several long minutes), deftly balancing it with two long sticks of incense. At one point it seemed to reach critical mass and explode, showering paper ashes all over the floor as the heated air inside blew off the flaming stack of burning paper she had placed on the top. Quite a show. 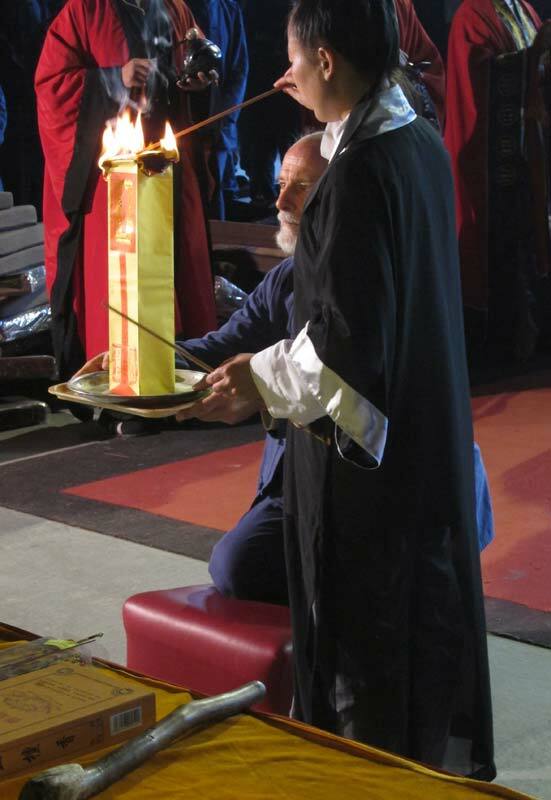 The Priestess places the offering on the box and ignites it! Back in my hotel room, I immediately sketched the two part vision, the Cloud and Thread and the Immortal with Dog in the Boat. I added a few short descriptive lines which Kathy then translated in Chinese for Master Wang’s interpretation. He immediately asked for ‘more details’. I added what I could and returned the sketch. It was a week later at the International Students private session with Master Wang that I heard his interpretation. I’m very glad I taped that session and BK’s daughter’s translation. The vision indicated ‘smooth sailing’ since the boat was moving easily and not say ‘stuck in the mud’. I was thankful for that. He said this was a sign of progress in practice, some contact with another realm and in contacting (touching) it, I was able to see something in this realm. His advice. ‘Hold your breath’ to make the vision last longer, and get as many details as possible. Color, shape, movement, inscriptions, every detail possible. The more detail provided, the more interpretation is possible. He also said 6 or 7 other students reported having similar visions at that same time. 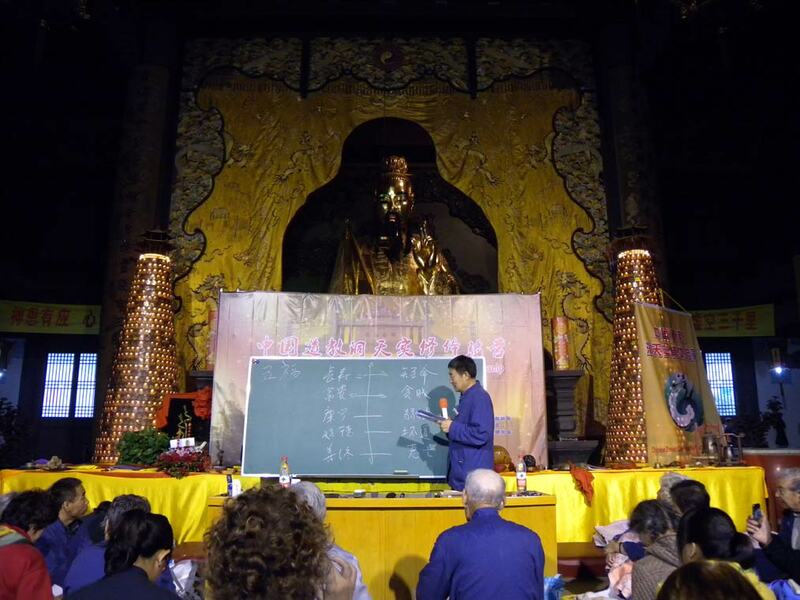 Later on the Double 9 day, Master Wang lectured on choosing the optimum location for ascension. Your birthplace is often the best, many immortal return to their home town to ascend. Also high mountains are good, since they are ‘closer to heaven’. 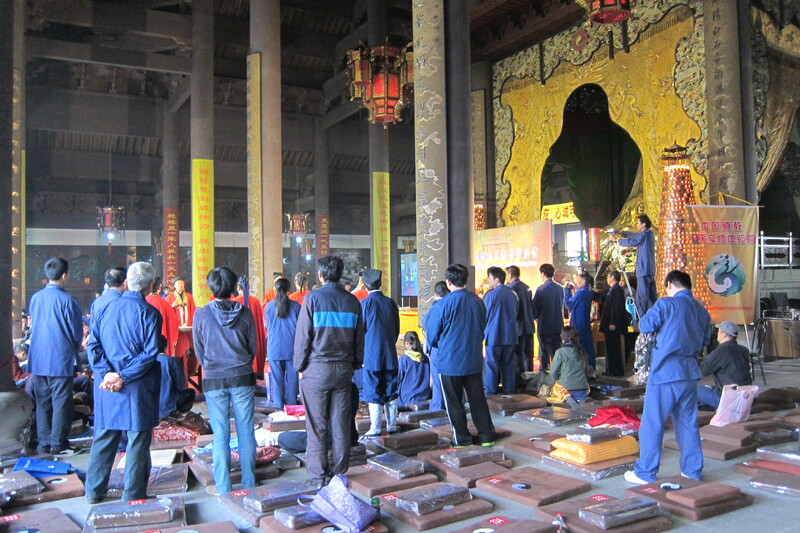 Master Wang Li Ping sponsored a retreat at the Jin Hua temple from Oct. 20 – 30, 2012. For anyone looking for a deep Chinese experience of Nei Gong and Taoist cultivation at an affordable price this is a remarkable opportunity. 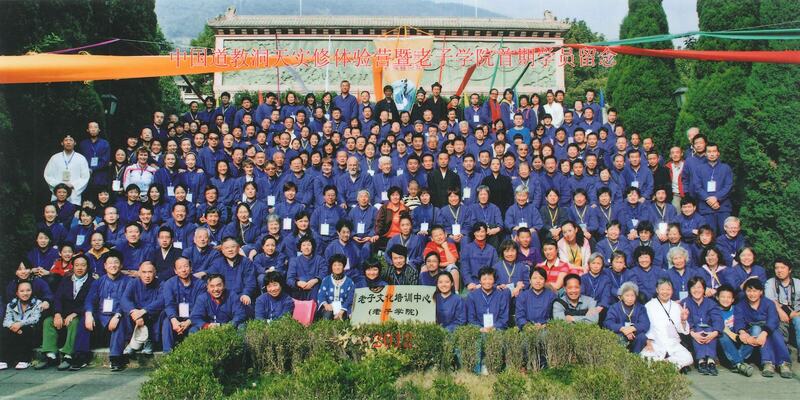 This year marked the founding of the Lao Zi Academy of China with Master Wang as the principle. With over 400 in attendance Master Wangs popularity among mainstream Chinese is every evident. Morning walking practice, twice dialy lectures and sitting practice as well as evening classes and an experience of Shui Gong (Daoist Dream Practice) filled evrey day to the fullest. Delicious and plentiful (mostly vegeterian) food for both the Taoist Association guests, and attendees living in the new Alchemy aHouse at the temple nourished everyone. 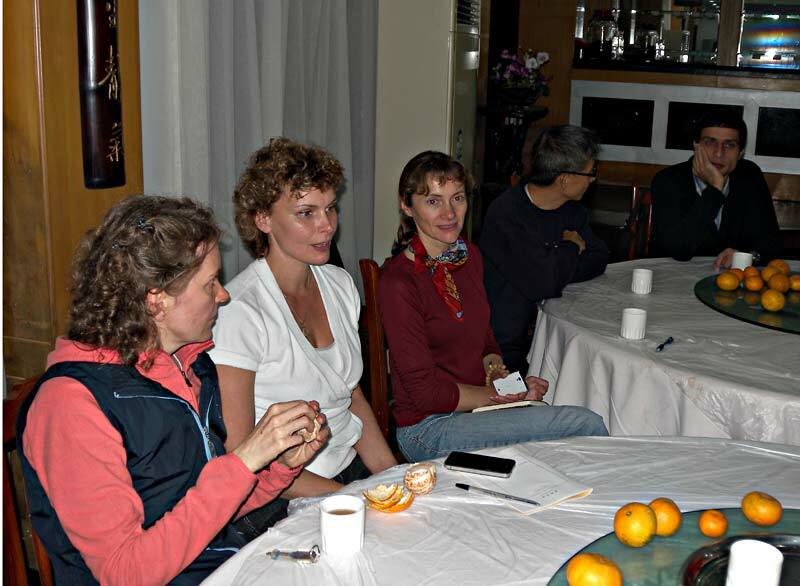 Master Wang’s senior students did all the guiding of sitted meditation, inspiring the writer with the variety and flexibility of their approaches to the cooking processes. 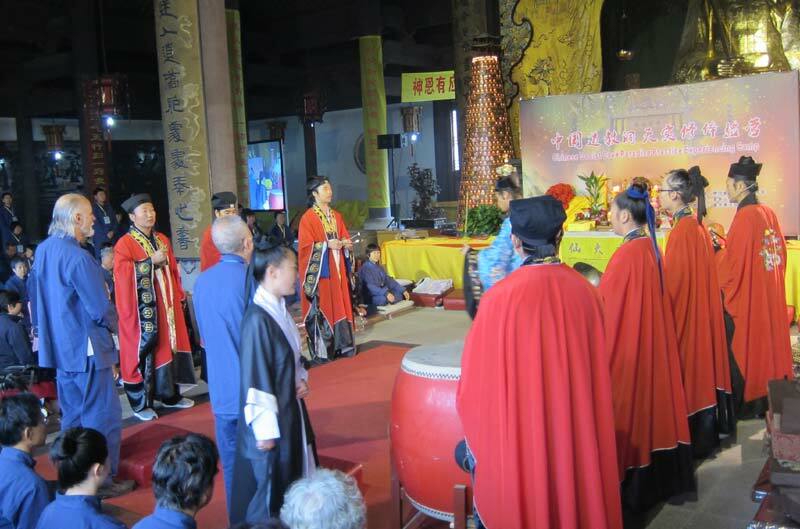 A perfect introduction to Daoist Nei Gong for any aspirant. Kathy Li, Master Wang’s USA desciple kindly purchased and provided tour guide type radio transmitter and receiving equipment to make English translation simply and invisibly available to non Manadarin speakers. A variety of translators including Ian Johnson, a Canadian living in Beigin, BK Wee from Singapore (and his delightful daughter) as well as Kathy herself filled the translator’s role. In all 4 Westerners ( 3 Russians and myself benefiitted from this essential service. Thank you Kathy, Ian and the Wees. 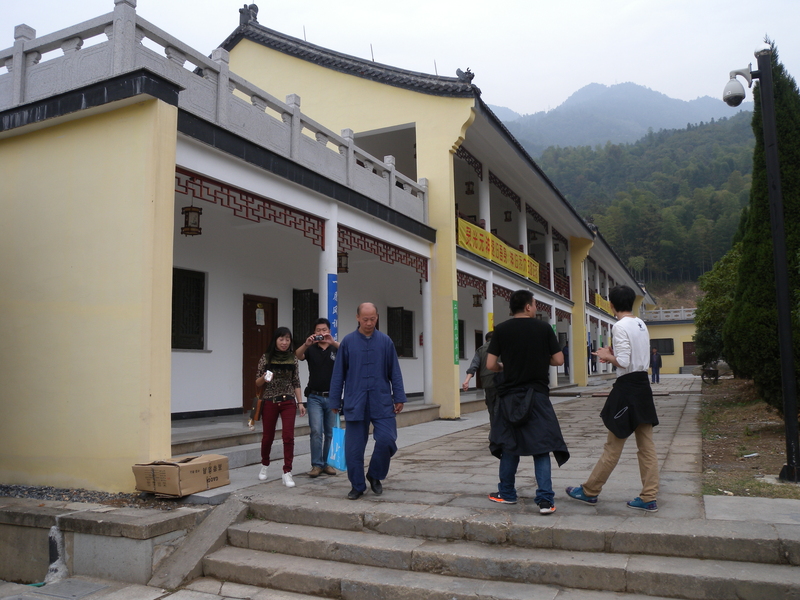 The sacred mountain environment, the precious temple energy, the food and of course the presence of Master Wang added up to a fantastic experience. Master Wang stood in the rain with us as we waited for the bus to drive down the mountain on the final day. 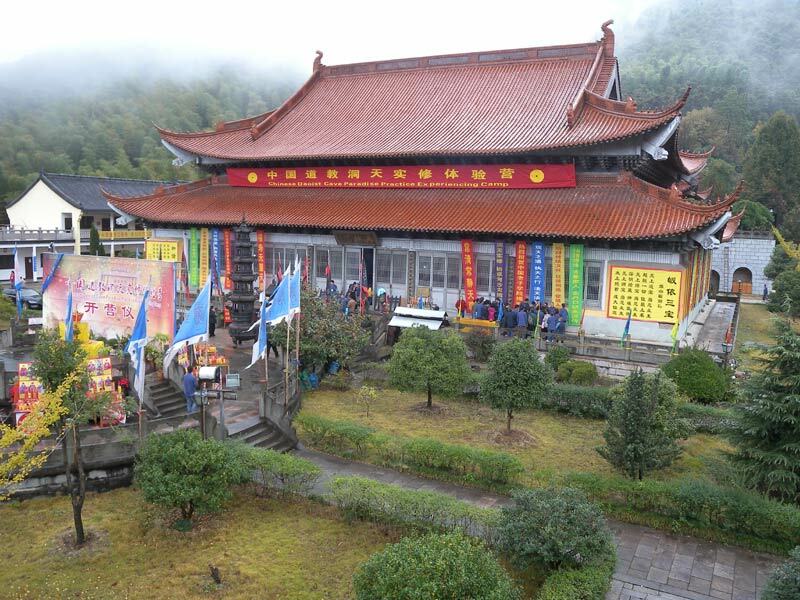 Main Building at Immortal Wang Temple on Jin Hua Shan, China. Chapter 5 of the Chung-Lu ch’uan-tao chi is devoted to Time and timing in Cultivation. This chapter follows up on the previous two, Chapter 3 covering Heaven and Earth and Chapter 4 the Sun and Moon. These preceding chapters emphasize the cyclical nature of cosmic phenomenon, and set the stage for the detailed discussion in Chapter 5. Lu starts with a question about the interaction of the Sun and Moon and Chung responds with a broad answer about the Four Periods of Time. The Day, Month and Year are the obvious observable cycles, while the Time of the Body (personal lifetime) is the primary cycle of the individual. Each has it’s place and importance. The Yearly, Monthly and Daily cycles need little explanation. The life cycle of the human is broken down into four 30 year periods of growth, maturation, aging and decay leaving 120 years for personal cultivation. The main focus is ON the issue of not wasting the precious time in the body, ‘difficult to hold on to, easiest to loose’. Years and Months ‘Come slowly but pass quickly’. The Days and Hours are ‘swift as lightning and short-lived as the spart of fire from flint”. The obvious answer is ‘Start when you are young when it’s easy to achieve yourself” but almost no one follows that advice and comes to the Tao only when they have a real problem or see death approaching when it’s almost always too late. Do not be like one who ‘sleeps in wet clothes in a draughty room’. like those who choose to be ill. So, how does one know the ‘Moment of Convergence’, what are the ‘methods of gathering’, how does one ‘refine yin at the height of yang’ and ‘cultivate yang at the height of yin’ ? This is the importance of timing in self cultivation. The classics speak often of ‘The Living Hour‘, superficially understood to be the hour of ‘Tzu‘, between 11:00 pm and 1:00 am, when the yang returns, represented by Hexagram 24, Return (Earth over Thunder). The real secret of the ‘living hour’ is much more subtle. The day is divided into twelve 2 hour periods, and the hour of Tzu is the first of these 12. The actual start of Tzu is experienced in solar time, not clock time, so you need to know the time of meridian passage for your location (longitude and latitude). On Energy-Master.com there is a simple widget you can use to calculate this for you. You enter your location (country, city and zipcode if available), the app uses Google geo-coding the calculate your Lat and Lng and hence the time of local noon for your location. With this you now know the actual clock time of the start of each double (or ‘big’) hour. Armed with this you can start to practice ‘the living hour’. Partly as an experiment in WordPress and also as a way to consolidate my ongoing work with the classics of Daoism (also spelled Taoism), I decided to utilize this domain I have held in reserve for a number of years for what I hope will be a useful purpose. Why read the Classics ? What makes a classic text, a Classic ? Depends on the lineage and school or sect. also depends on the reader and what they want to achieve. Hsin Ming Fa Chueh Ming Chih – The Secrets of Cultivating essential nature and Eternal Life – This is a ‘modern’ classic from 1860 and should be considered in a somewhat different category, but a classic none the less. There are numerous translations of these text in English and most Western languages. I have editions by Thomas Cleary, Eva Wong, Wang Mu, Wang Liping, David Verdesi, Lu K’uan Yu, Richard Wilhelm and others. Reading a wide variety of interpretations is useful and important in my view. With the exception of Wilhelm, who takes a clearly psychological view, I have found all the above translators or interpreters work useful and informed. Cleary is a Buddhist and his skilled and readable translations make that obvious. He doees however need to be read in that context. Eva Wong is a classically trained religious Daoist with the ability to interpret that comes only from long experience in the tradition. Both Wang Mu and Wang Liping are initiates in the Longmen pai (Dragon Gate Sect). WLP is the current lineage holder. His biography is published as ‘The Making of a Modern Taoist Wizard’. His version of the Chung Lu Tao Chuan Chi is available in his ‘Ling Bao Tong Zhi Neng Nei Gong Shu’ translated into English by Richard Liao. This text contains the only teaching I know of that follow up as promised in Chung and Lu’s classic with the ‘Ling Bao Bi Fa’. Wang Mu’s commentaries are translated by Fabrizio Pregadio. Lu K’uan Yu’s work is a translation of Chao Pi Ch’en’s classic. I’m going to post my reflections on my ongoing work with these texts as the moment arises. I’m starting again with the Classic of Chung and Lu. Ancestor Lu (the ‘student’ in the course of the text) is one of the Eight Immortals and perhaps best known for his closeness to humanity and renowned ‘availability’. I’m working actively with that in mind.